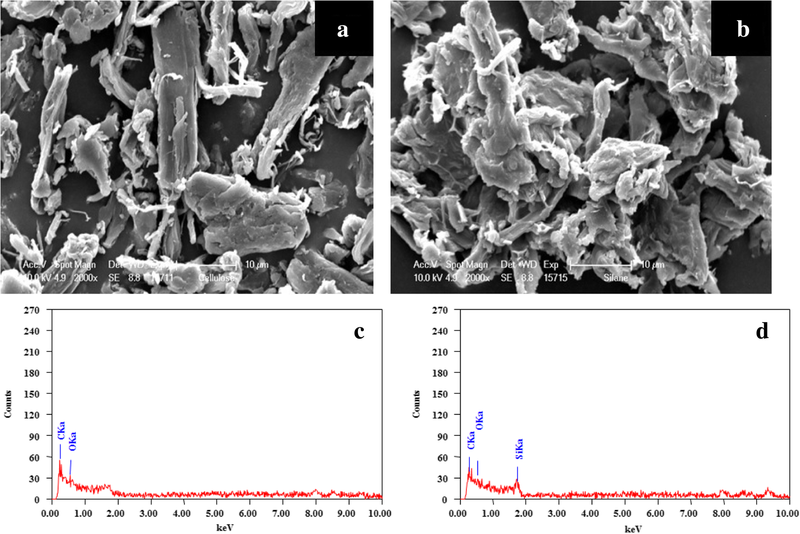 The adsorption removal of C.I Reactive Blue 21 (RB-21) dye from aqueous solution by commercial MCC was successfully modified with aminopropyltriethoxysilane. The various physiochemical attributes like initial dye concentration, contact time, solution pH, adsorbent dose and temperature were evaluated. The surface modification was characterised and confirmed with specific surface area analyser using Brunauer–Emmett–Teller, Fourier Transform Infrared Spectroscopy, Scanning Electron Microscopy, Energy Dispersive Spectrometer and X-ray diffraction. The adsorption kinetics, isotherms, and thermodynamics were explored. The Langmuir, Frendlich and Redlich-Perterson isotherm models were studied with the Langmuir adsorption isotherm model showing the best fit with the adsorption capacity of 30 mg g− 1 at 323 K. The kinetic data was considered using pseudo-first-order and pseudo-second-order. The results indicated that the pseudo-second-order model was preferred with good correlation. 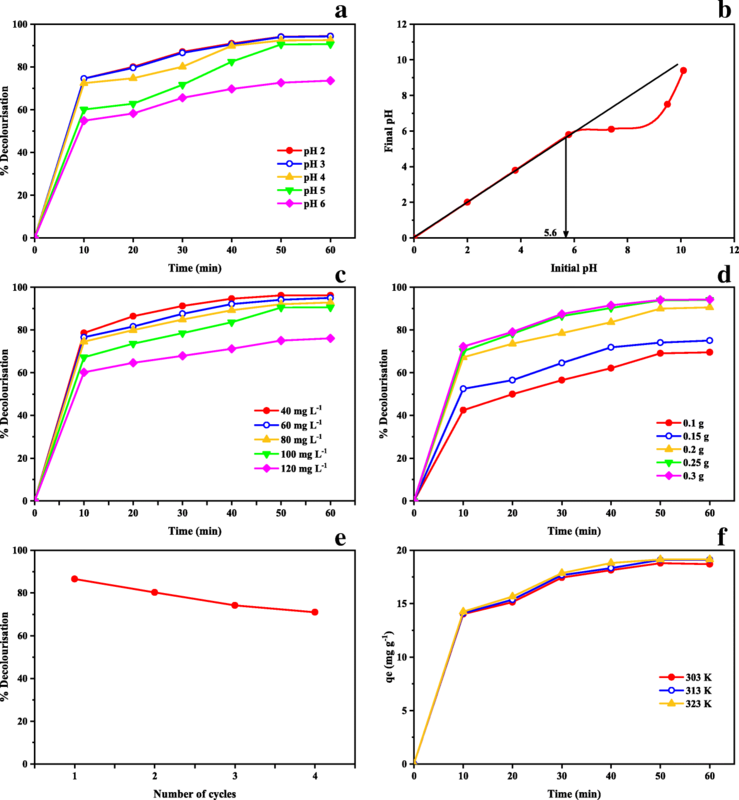 The thermodynamic attributes like changes in standard enthalpy, standard entropy and standard Gibbs free energy were assessed at different operating temperatures. Hence, current research work shows efficient removal of RB-21 dye from effluent solution by modified microcrystalline cellulose. Dyes are organic aromatic compound possessing intense color and generating considerable amount of colored waste water and are highly toxic that contribute noteworthy contamination of aquatic ecosystem. Moreover, they actively absorbs solar energy which reduces the intensity of solar light absorbed by the water plants, and create serious threat to aquatic organisms [1, 2, 3]. Reactive dyes constitute a major textile wastewater; they are highly soluble in water and the most persistent dye. Reactive dyes are anionic dyes that comparatively require easy dyeing process and find major application for dyeing cellulose fibers like cotton, rayon, silk, wool and leather. Reactive dyes are considerably used in textile industry, essentially due to the ability of their reactive groups to attach on textile fibers by covalent bond formation . C.I Reactive Blue 21 (RB-21) is difficult to decompose due to its stable aromatic structure. Thus, the aromatic complex structure of RB-21 dye is tough to biodegrade. The release of this dye into river streams from various textile industries may cause acute problems because of their toxicity, mutagenicity, and non-biodegradability and are detrimental to aesthetic value of the environment . 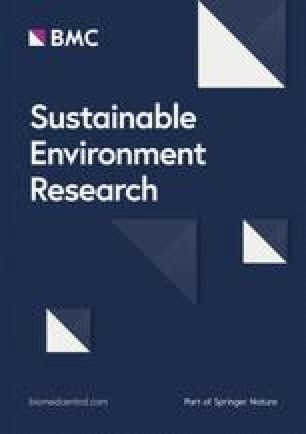 Dye removal from effluent was extensively studied using diverse physical-chemical process that involve methods such as coagulation, flocculation , ozonation , aerobic-anaerobic treatment , and cation exchange membranes , but all suffer from one and more limitations, as most treatments are expensive that cause significant problems by the use of harsh type of chemicals and involve tedious process. In contrast with various treatment processes, adsorption is economic and highly efficient method for removal of color from dye wastewater that improves the purity of water resources. Adsorption process involving activated charcoal is the highest reliable adsorbent however its high price restricts its wide application. In this regards, the major shift has occurred towards the use of low cost naturally occurring waste materials. Therefore, significant focuses of researchers have directed to explore new promising alternatives for removal of dyes from wastewater . Cellulose, abundantly found in nature has gained noticeable attention due to its low cost, economic execution, wide availability; also they are renewable and sustainable material. Accordingly, cellulose as well as cellulose-based waste products  has been used including saw-dust , rice-husk , and orange peel  for the removal of colored matter from dye wastewater. Precisely, cellulose is greatly marked as an efficient adsorbent and the structure has been chemically modified, which stimulates the adsorption capacity of dye from wastewater effluents . A surface modification of cellulose includes attachment of alkaline centre in the cellulose structure using distinct nitrogen precursors (e.g., ethylenediamine , 2- aminomethylpyridine , cationic and anionic forms of cellulose were synthesized by presenting quaternary ammonium and carboxyl groups to remove ciprofloxacin from aqueous media . Modification of cellulose by grafting a quaternary ammonium salt was used for removal of amoxicillin from aqueous solution . 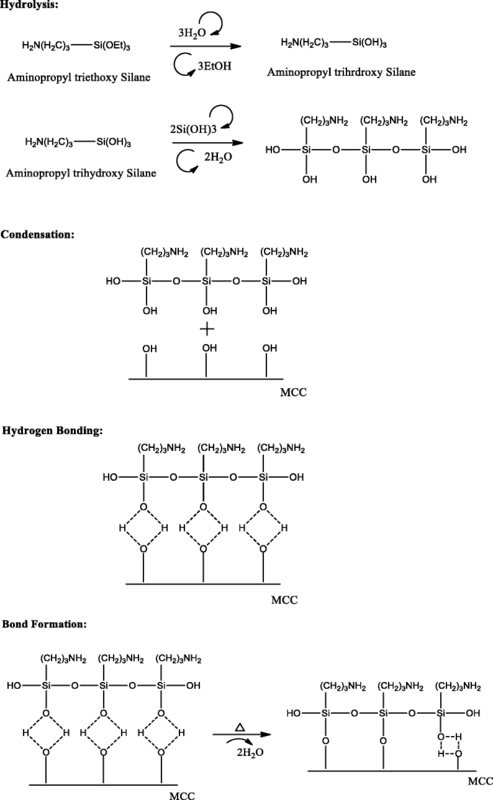 The phosphate derivatives of cellulose have been employed in the treatment from the acetaminophen saturated water . Adsorption capacities of cellulose have been considerably enhanced after treatment with amines such as 3-chloro-2-hydroxypropyltriethylammonium chloride , triethylamine , and tetramethylethylenediamine . To date, there has been no information in representing microcrystalline cellulose (MCC) as adsorbent grafted with aminopropyltriethoxysilane (APTES) for the removal of RB-21 dye from aqueous solution. In the current protocol, we herein report the chemical modification of MCC by linking of amino group to the backbone of MCC using APTES. The modified MCC (MMCC) was characterized by Brunauer–Emmett–Teller (BET), Fourier Transform Infrared Spectroscopy (FTIR), Scanning Electron Microscopy (SEM), Energy Dispersive Spectrometer (EDS) and X-ray diffraction (XRD). The adsorption efficiency of the product was evaluated by employing optimization studies using different variables, such as initial dye concentration, contact time, solution pH, adsorbent dose and temperature. Moreover, the results were evaluated via different isotherm, kinetic and thermodynamics models. RB-21 was procured from Colourtex Industries Pvt. (India). The material used in this work was commercial MCC having size 13 μm purchased from Rettenmaier India Pvt. (India). APTES was procured from Rishichem Distributor Pvt. (India). The pH was adjusted to the desired value by adding 0.1 M acetic acid or 0.1 M sodium hydroxide. Ethanol, soda ash, glauber’s salt, acetic acid, and sodium hydroxide were bought from S D Fine-Chem Pvt. (India). All the experiments were carried out using distilled water. 0.15 mL of APTES (1% weight of MCC) was dissolved in a mixture of 80/20 (v/v) ethanol/water solvent, and was stirred using magnetic stirrer for 1 h which became hydrolysed to form reactive silanol groups. 15 g of MCC was added in this solvent mixture and further stirred for 2 h. Ethanol was removed by evaporation by exposing it to ambient temperature for 24 h. This grafted MCC was subsequently kept in the oven at 393 K for 2 h for curing followed by thorough washing with water to remove the last traces of ethanol then drying at room temperature. The MMCC powder was used for further study. The hydrolysis of three labile groups occurs giving rise to three hydroxyl groups. Later, addition of water and alcohol favours a high degree of polymerization and stabilized monomeric silanol is formed. The silanol forms hydrogen bond with the OH groups of the MCC. Finally, during curing, formation of covalent bonds with the MCC proceeds with simultaneous water loss . The reaction mechanism of surface modification of MCC is systematically represented below. where, Ci is the initial dye concentration before sorption in mg L− 1, Ce is the equilibrium concentration of dye after sorption in mg L− 1. To study the effect of silane, the APTES percentage was varied as 1, 3, 5 and 6% on the weight of MCC. It was dissolved in the mixture of 80/20 (v/v) ethanol/water and stirred using magnetic stirrer for 1 h to hydrolyse and form reactive silanol groups. After 1 h, 15 g of MCC was added in each beaker and further stirred for 2 h. Each beaker was poured onto petri dish to evaporate ethanol. After complete evaporation of ethanol it was placed in oven at 393 K for period of 2 h. These powders were used for further batch study. Desorption experiment were studied to analyse the reusability of the adsorbent. After the completion of experiment, the used adsorbent was centrifuged to separate the adsorbent and dye solution. Further, it was filtered through Whatman filter paper and rinsed mildly for several times with distilled water and further with acetone to get rid of some type of dye attached to the adsorbent particles. The washed adsorbent was then rinsed at room temperature before using for the next run of experiments. Following characterisation was carried out to understand the changes taking place after modification. The specific surface area of MCC and MMCC was studied through Nitrogen atmosphere adsorption at 77 K using BET Sorptometer (PMI, USA). The FT-IR-8400S manufactured by Shimadzu (Japan) with a scanning resolution of 4 cm− 1 was used to detect the IR spectra of samples. It was observed in the range of 4000–800 cm− 1. The powdered adsorbent was fixed on an aluminium holder and sputtered with gold-palladium alloy in a sputter coater and were characterised by SEM (Philips XL-30, Netherlands). The surface structure of the MCC before and after silane modification was analysed by EDS (JEOL JSM-638OLA, Germany). The morphology of different crystalline phases was identified by XRD and was recorded on XRD-6100 Simadzu (Japan) at 40 kV and 30 mA. The diffraction pattern was obtained in equal reflection mode with Cu Kα radiation (λ = 1.5405 Å). The angular range (2θ) was obtained from 5 to 30° and the measurements were brought together having a sampling pitch of 0.02° employing uninterrupted mode of scanning, at the rate of 2° min− 1. By using Eq. (2) Segal method, crystallinity index (ICr) of the adsorbents was estimated. where Iam is the intensity of the background scatter measured at 2θ angle array in the middle of 16 and 20°, when the intensity is least, and I002 gives extreme intensity of diffraction from the 002 plane at a 2θ angle in the middle of 22 and 24°. With the purpose to figure out statistical parameters, single-factor analysis of variance with excels was incorporated. Statistical analysis is a decisive mode to explicate the data. All the experiments were brought about in triplet and the outcome effects is numerated as mean ± SD. P-value lower than 0.5 are statistically significant. Pore size are classified as micropores (< 20 Ao), mesopores (20–500 Ao) and macropores (> 500 Ao). The BET surface area was found to be 17 and 43 m2 g− 1 for MCC and MMCC, respectively. The isotherm observed was of Type IV mesoporous surface showing a linear increase of adsorbed-desorbed volume at low pressure and shows limited uptake at a relative pressure and also exhibited hysteresis loop which indicated the mesoporous nature of the prepared material . In addition, the total pore volume and average pore size of MCC were 0.021 cc g− 1 and 51.17 A° and for MMCC, they were 0.049 cc g− 1 and 46.50 A° indicating that material is mesoporous in nature. Figure 1 clearly depicts the FTIR spectra of MCC and MMCC. As seen from Fig. 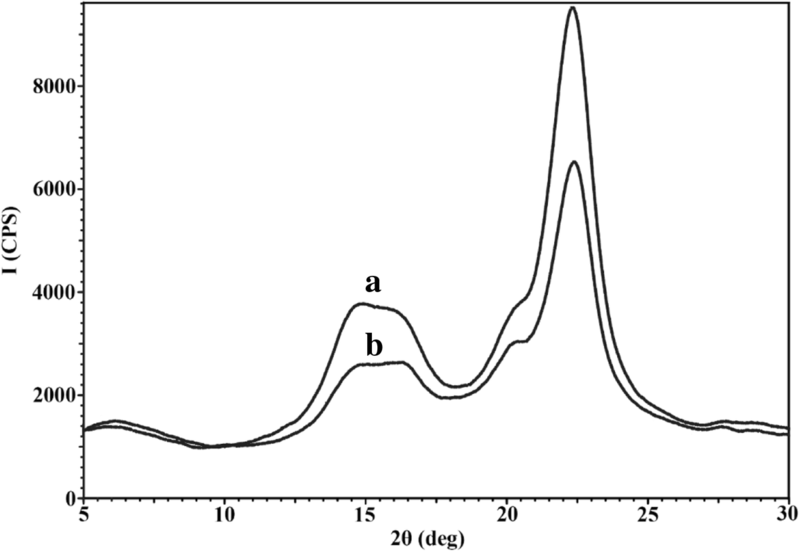 1, the band at 3346 cm− 1 was observed for MCC that features O-H stretching vibration of hydroxyl group of cellulose and the peak at 2885 cm− 1 corresponds to C-H stretching region. New absorption peak at 1560 and 1481 cm− 1 was noted in the spectrum of MMCC which were due to the N-H bending vibration of primary amine proving the successful grafting of the APTES onto the MCC. The peaks at 3346 cm− 1 responsible for O-H bond were subdued because of the reduction in the number of this functional group . The strong absorption peak around 1249, 1034 and 700 cm− 1 regions is allocated to the Si-O-Si and Si-O-Ccellulose . 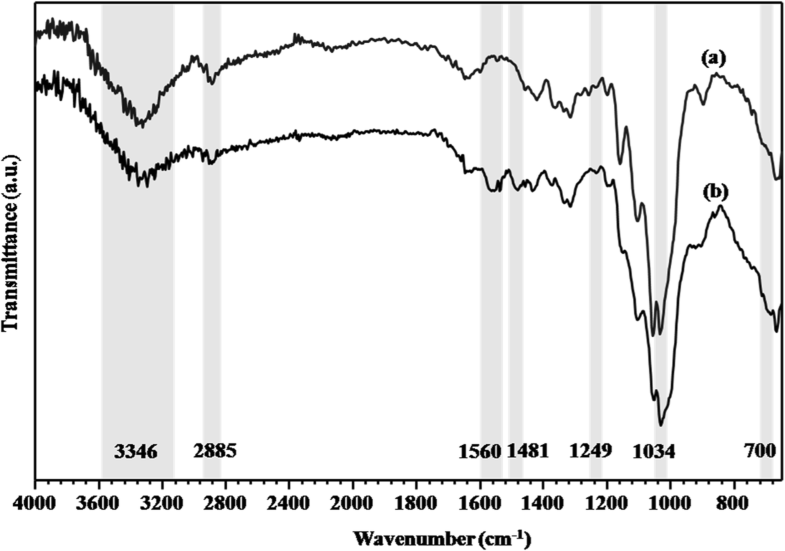 The intensity of the peak at 1034 cm− 1, is an overlay of Si-O-Si band and the C-O stretching of cellulose, which increases after treatment of silane, providing clear proof of silane reaction . SEM photographs (at 2000x magnification) of MCC and MMCC powder are illustrated in Fig. 2a and b whereas elemental analysis was carried out by the EDS analysis of MCC and MMCC powder as represented in Fig. 2c and d. Figure 2a showed virgin MCC which has irregular shape, smooth surface and compact rod-like aggregates. Figure 2b showed MMCC powder becoming rougher and porous after modification process. The porous nature was suitable for the RB-21 dye adsorption. For EDS analysis, it was found that in Fig. 2c, MCC contains presence of C (63.3%) and O (36.8%). Figure 2d clearly shows MMCC which contains C (55.1%), O (2.6%) and Si (12.3%). Si peak provides evidence for the presence of APTES on the MCC skeleton . MCC powder and MMCC were crystallographically characterized by means of XRD. From Fig. 3, the peaks at 2θ = 14.7, 16.4 and 22.2 corresponds to the crystal structure of MCC, typically that of cellulose-I structure only. The crystallinity of MCC and MMCC was found to be 76.7 and 75.6% respectively. From these values it is verified that the crystallinity of MCC remains same after modification and had no effect on adsorption study. Percentage removal of RB-21 was studied using 100 mg L− 1 of the dye at pH 3 and 0.2 g of adsorbent for 60 min by varying the percentage of silane grafted on MCC. Removal of RB-21 was carried out with unmodified MCC powder, but results obtained were very poor. From the trial studies as discussed in section 2.2.3, it is clear that no difference in the removal percentage of the dye beyond 5%. Hence 5% of silane was selected for removal of RB-21 in the next steps of this study. The solution pH is a pre-eminent parameter for decolourisation, in determining the surface charge of adsorbent, by amending the chemical stability of the ionic groups, consequently effecting electrostatic interaction . In order to investigate optimum pH value, adsorption experiments were performed at different pH range (2–12). Figure 4a depicts that dye sorption decreases with increase in pH value with satisfactory adsorption of RB-21 from pH 2 to 4, in which most of the amine group (−NH2) are protonated, which is necessary for the attraction of anionic sulfonic groups of the dye molecule. At higher pH, free hydroxyl groups (OH−) in solution are in competition with anionic sulfonic groups of RB-21 for the adsorption sites of the MMCC thereby decreasing adsorption sites for the dye molecule. Thus, lower pH values (pH 2) for the adsorption of RB-21 dye was considered optimum and used for further experiment . The effect of pH on the dye removal can be explained by studying the zeta potential values of adsorbent at various pHs . To determine the pHzpc, 50 mL of 0.01 M NaCl solution were added in various Erlenmeyer flasks. To each flask, 0.2 g of adsorbent was added. Further, the pH values of the above solution were regulated in range of 2–12 by adding either 0.1 M HCl or 0.1 M NaOH solution. Now, each flask was preserved for 48 h and the final pH was enumerated. The graphs were plotted amongst pHfinal versus pHinitial and the point of interaction of the curve of pHfinal versus pHinitial was reported as pHzpc. As seen from the Fig. 4b, pHzpc of adsorbent was found to be 5.6. At pHs below pHzpc, the reactant surfaces become positively charged which attract anions present in the solution. The exterior layer of adsorbent is negatively charged at pHs higher than pHzpc, thus attracting cations. In this study, lower pH is suitable for removal of dye, due to electrostatic attraction between positively charged sites and negatively charged dye ions . The effect of initial dye concentration and contact time on the adsorption of RB-21 dye onto the adsorbent is shown in Fig. 4c (0.25 g of MMCC at pH 2). Initial dye concentration is inversely proportional to percentage of dye removal as certain fix amount of dye is adsorbed for given mass of adsorbent. When concentration of dye is higher, the removal efficiency will be lower. This is because when concentration decreases, there will be more active sites for adsorption. By increasing the concentration there will be less active sites for adsorption. As a result, when initial concentration increases, it exhausts the adsorption process sharply. The equilibrium adsorption capacity increased from 8 to 20 mg g− 1 with the increase of the initial dye concentration from 40 to 120 mg L− 1. It is observed that dye concentration acts as a driving force against the resistance for dye transport from the solution to the adsorbent. It seems that the amount of dye adsorbed increases with increase in contact time and then attains equilibrium state. At first stage, adsorption process was prompt and consequently the adsorption rate reduced for all the initial concentrations, slowly reaching equilibrium. It was found that for adsorption of 100 mg L− 1 of dye concentration, it took 50 min for equilibrium to obtain contact time. This reading was taken into consideration for further experimentation to verify that equilibrium and dye adsorption is achieved . Various trails of experiments for different adsorbent doses were conducted using initial concentration as 100 mg L− 1 for 50 min keeping the volume unchanged, i.e., 50 mL. The results of experiment show that the quantity of active sites on the exterior increases with increase in dosage i.e. they are directly proportional as shown in Fig. 4d. As a result, when the dosages were increased, there were more active sites which caused higher percentage removal of dye. Thus the dye removal efficiency enhanced drastically from 70 to 94% with increase in the adsorbent dosage as shown in Fig. 4d. Further experiments with adsorbent beyond 0.25 g showed that there was no marginal or specific change in the results. It was observed that for 0.25 g of adsorbent, maximum efficiency of removal was 94%. Thus, it can be considered that 0.25 g is the optimum amount of adsorbent for decolourisation. In order to make the method economical, the reusability of the adsorbent was explored by using the recovered adsorbent for successive cycles under optimized reaction conditions (pH 2, dye concentration 100 mg L− 1, 0.25 g of adsorbent and 50 min). After completion of each cycle, the used adsorbent particles were separated from dye solution through filtration using Whatman filter paper and washed several times with distilled water and further washed with acetone to eliminate the residues of dye molecule, dried at room temperature before reuse. As seen in Fig. 4e, the dye removal efficiency was 87, 80, 74 and 71% from cycle 1 to 4. Comparatively lower adsorption/desorption of dye conveys that chemisorption might be the main condition of dye removal. Other important study was borne out as in to simulate the actual dye effluent; cotton fabric was dyed with the RB-21 dye in the open bath. Material to liquor ratio of 1:30 and 2% of dye solution was used on the weight of fabric basis. Dyeing was started at room temperature and the temperature was gradually raised to 65 °C. 80 g L− 1 of glauber salt was added after reaching 65 °C and the dyeing was continued for 30 min. Later 20 g soda ash was added and dyeing lasted for another 60 min. The spent dye liquor after dyeing was collected and treated with modified adsorbent. About 0.25 g of adsorbent was added into 50 mL of the wastewater and stirred at 150 rpm for 60 min. After that, the solution was centrifuged for 15 min at 3000 rpm and supernatant solution was analysed at 622 nm using UV-Vis spectrophotometer and dye removal was found to be 60%. Thus it was observed that less adsorption takes place in the presence of salt which covered adsorbent surface, resulting from competition between negatively charged ions of the salt and dye anions for the adsorption sites. The salt anions are smaller in size and have a greater surface charge density hence they are more strongly adsorbed. The effect of temperature (303, 313, 323 K) on the adsorption was evaluated using an initial dye concentration of 100 mg L− 1 with 0.25 g of adsorbent at pH 2. Temperature in the adsorption studies is used to predict whether it is an exothermic or endothermic process. Figure 4f indicates that there is slight improvement of decolourisation with temperature which may be related to an increase in active surface sites as well as larger pores size available for adsorption on adsorbent . The adsorption capacity increased from 23 to 30 mg g− 1 with the rise in temperature, indicating that the adsorption process of RB-21 by MMCC was an endothermic in nature. 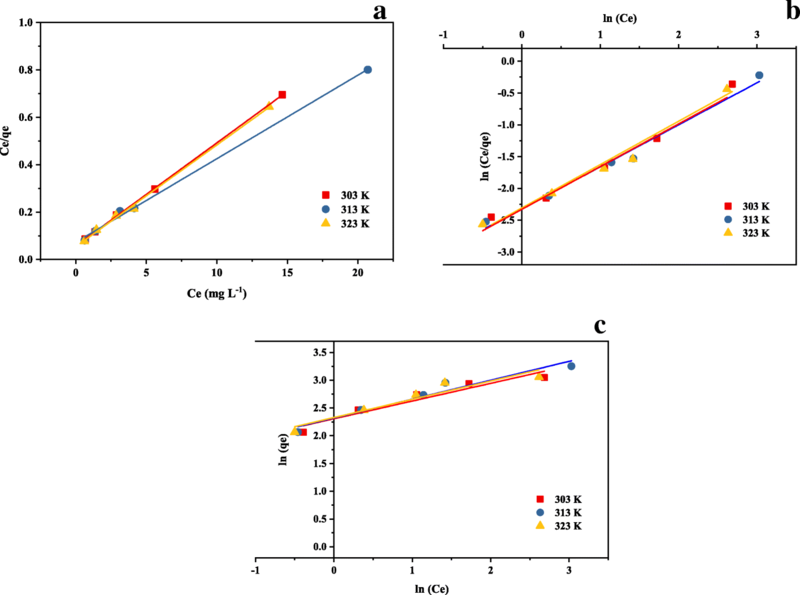 Thermodynamic attributes for the adsorption of RB-21 dye with initial dye concentration of 100 mg L− 1 onto MMCC at distinct temperatures were calculated. The ∆G° at 303, 313 and 323 K are −16.4, −15.8 and −15.3 kJ mol− 1 respectively. The negative values of ∆G° at all temperatures specify the practicability and spontaneous nature while the positive ∆H° (33.4 kJ mol− 1) value indicates endothermic nature. The positive nature of ∆S° value (0.47 kJ mol− 1) indicates the increased randomness at adsorbent/adsorbate edge during adsorption of the dye onto the MMCC. The adsorption isotherm is an equilibrium data which expresses the correlation among the amounts of adsorbate adsorbed per unit weight of adsorbent and shows the distribution of adsorbates among the liquid/solid phases. The equilibrium results for the removal of RB-21 in the present work examination were assessed using Langmuir, Freundlich and Redlich-Peterson isotherm equations as presented in Fig. 5 with the values obtained specified in Table 1.
where, Ce is the equilibrium concentration of the adsorbate, qe is the amount of adsorbate per unit mass of adsorbent, qmax and b are Langmuir constants which are related to the adsorption capacity and adsorption energy, respectively. The results from Langmuir model are shown in Table 1 and the correlation coefficients signify the fitness of Langmuir isotherm. The correlation coefficient (0.99) value implies the fittingness of the linear mode of Langmuir model. The superlative monolayer sufficiency qmax derived from Langmuir model increases with increase in the temperature and the data procured intended that the superior adsorption is consistent to a saturated monolayer of adsorbate molecules on the superficial to adsorbent suggesting endothermic nature of adsorption. where, Kf and n are the Freundlich isotherm constants. Kf is defined as the adsorption capacity, while 1/n provides estimation of the intensity of adsorption. Values, n > 1 represent favourable adsorption condition. However, correlation coefficients (R2 < 0.90; Table 1) is lower than Langmuir values, which shows that adsorption onto MMCC not following Freundlich isotherm closely. where, KRP and aRP are the Redlich-Peterson adsorption capacity constant and isotherm constant, respectively with β between 1 and 0. From Table 1, the R2 > 0.98 can be consider as less applicable than the data obtained for other 2 isotherm models, namely Langmuir and Freundlich isotherm models. Hence Redlich-Perterson isotherm model has been ruled out. The data of the current study indicates that Langmuir isotherm model is the utmost adapted for the fitting of adsorption isotherm of RB-21 dye by MMCC. The maximum adsorption capacity of RB-21 dye was calculated to be 30 mg L−1. where, k represents the diffusion rate component. The value derived from the intercept (I) is analogous to the probable thickness of the film borderland layer. If the primary part of Weber- Mores plot is a straight line graph passing through the origin, it specifies that an adsorption process is solely induced by intraparticle diffusion. Whereas, the intercept on y axis with negative value signifies the impact of apparent film diffusion obstruction. The literature data have revealed positive intercept for adsorption on carbonaceous matter that signifies instantaneous uptake of initial adsorbate . With the intention to evaluate the adsorption mechanism like mass transfer or diffusion control and chemical reaction it is effective to ascertain the kinetic model. Hence, pseudo-first-order and pseudo-second-order models were evaluated to examine and formulate the adsorption kinetics of the dye . where qt represents the quantity (mg g− 1) of adsorbate at time t (min) and k1 is the rate constant (min− 1). The rate constant was evaluated by plotting out slope of ln (qe − qt) versus time (t) as shown in Fig. 6a. It is noted from the results in Table 2 that pseudo first order is not in accordance with the adsorptive efficiency and the correlation coefficient value is lower. Thus, the adsorption of RB-21 onto MMCC fails to obey pseudo first order kinetics. where, k2 is the rate constant (g− 1 mg min). The value of k2 and qe were enumerated from the intercept and t/qt versus t represents the slope, as shown in Fig. 6b. The k2 and R2 of the above two kinetic models are shown in Table 2. It clearly indicated from the results, that pseudo second-order kinetic model represented R2 > 0.99 for all the given concentrations and the rate constants value were lower with increase in the initial concentration of dye. The qe was found to increase from 8 to 20 mg g− 1, with increasing initial dye concentrations ranging from 40 to 120 mg L− 1. The high values of R2 > 0.99 suggest a better fit of data with a pseudo-second-order kinetic model. The study validates that MMCC is an efficient and excellent adsorbent for decolourisation of RB-21 dye from the aqueous solution and the adsorption was accomplished in 50 min. The optimum adsorption was achieved at 0.25 g catalyst, for 50 min with adsorption capacity of 30 mg g− 1 at 323 K at pH 2. The adsorption isotherm of Langmuir model offered a better fit of the data. The thermodynamic parameters were evaluated at different temperature with ∆S° found to be 0.47 kJ mol− 1 k− 1. The pseudo second order model was better fit to the well observed adsorption data. The superior adsorption capacity of RB-21 using MMCC signifies wide applicability of dye removal in various textile industries. The researchers would like to acknowledge the facilities made available by the DST, Govt of India through FIST and World Bank funded TEQIP-II in completing this research project.